Spray a 4 quart slow cooker with cooking spray. In a large bowl, add the cake mix, pudding mix, eggs, water, oil, and sour cream and beat until smooth. Stir in the chocolate chips. Pour mixture into the slow cooker and cook on low for 4-5 hours or until cake is set. Every slow cooker cooks at a different speed so make sure to check it at 4 hours. The cake will still be moist but not soggy. Remove pot from slow cooker so cake does not continue cooking. Serve warm with a large scoop of vanilla ice cream. Decadent chocolate cake made in your slow cooker…whaaattt? This Slow-Cooker Chocolate Cake is made easy using a chocolate cake mix, instant pudding mix, some sour cream, oh…and some more chocolate chips to up the chocolate factor. This really cake should be called death by chocolate. Pour all of the ingredients into a slow cooker and get ready to be tortured all day by the smell of chocolate radiating throughout your house. After four hours, your salivary glands will be on overload ready to dig into this chocolate heaven. The pudding mix makes this cake moist and flavorful. The only way to eat this cake in my opinion is with a huge scoop of vanilla ice cream. 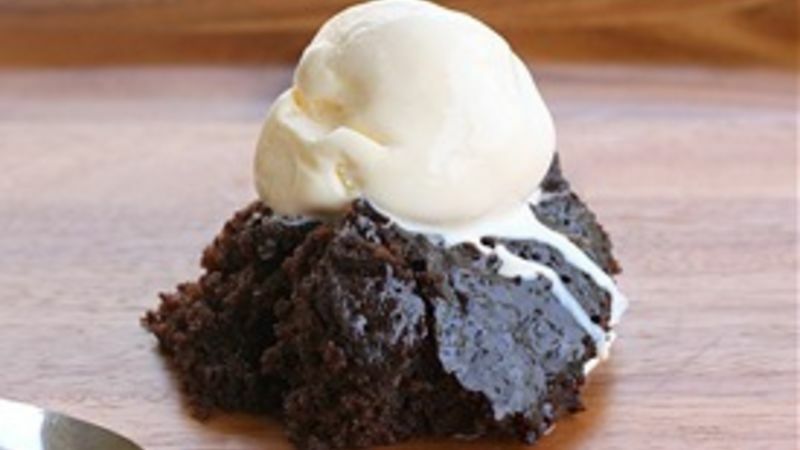 The cool ice cream melts into the warm cake making for a decadent and gooey treat. This is a casual dessert as it cannot be sliced like a traditional cake but rather scooped onto a serving dish. Trust me -- I don’t think anyone will mind. No heating up your house with a hot oven! The slow cooker does all of the work here in this shockingly easy dessert. I do have to say that every slow cooker cooks differently so make sure to check it after 4 hours. Try not to burn your tongue licking the slow cooker! More Slow Cooker Desserts Desserts in the slow cooker? Who’d have thought it? Here are a few more to try!